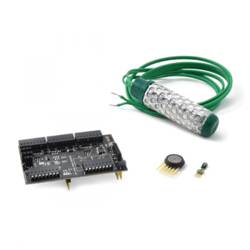 Our range of products include smart water iot vertical kit, waspmote agriculture sensors kit, waspmote communication kit, waspmote events sensor kit, waspmote gas sensors kit and smart agriculture iot vertical kit. Smart Water IoT Vertical Kit is equipped with multiple sensors to improve and simplify remote water quality monitoring (pH, Dissolved Oxygen, Conductivity, etc). Using this kit swimming pool conditions can be remotely controlled, and cities can benefit by monitoring the quality of tap water. The Waspmote Agriculture Board allows to monitor multiple environmental parameters involving a wide range of applications, from growing development analysis to weather observation. For this, it has been provided with sensors for air and soil temperature and humidity, solar visible radiation, wind speed and direction, rainfall, atmospheric pressure, leaf wetness and fruit or trunk diameter (dendrometer). Up to 14 sensors can be connected at the same time. With the objective of extending the durability of the device after the deployment, the board is endowed with a solid state switches system that facilitates a precise regulation of its power, prolonging the life if the battery. The Waspmote Agriculture Board may take up to 14 sensors. This kit includes 3 of them for testing purposes. Waspmote is based on a modular architecture. The idea is tointegrate only the modules needed in each device optimizing costs. For this reason all the modules (radios, sensor boards, etc) plug in Waspmote through sockets. 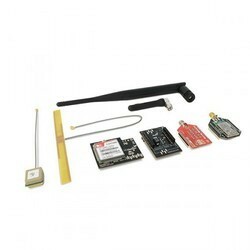 This kits is launched with the aim of testing all wireless protocols with Waspmote. 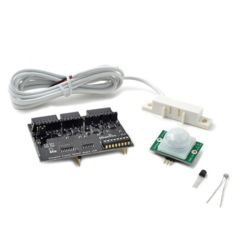 The Waspmote Gases 2.0 board has been designed to monitor environmental parameters such as temperature, humidity, atmospheric pressure and 14 different types of gases. It allows the inclusion of 6 gases sensors at the same time, the regulation of their power through a system of solid state switches and the amplification of the output signal of each one of them through a non-inverting amplification stage of a maximum gain of 101 controlled by a digital potentiometer configurable through the Inter-Integrated Circuit Bus, I2C). The Waspmote Gases Board may take up to 14 gas sensors. This kit includes 4 of them. 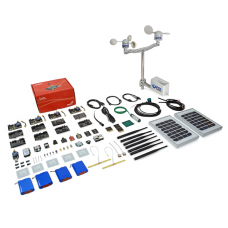 This kit enables monitoring of environmental parameters in agriculture, vineyards, greenhouses or golf courses. Soil moisture and temperature, humidity, leaf wetness and atmospheric pressure sensors allow to control the amount of sugar in grapes to enhance wine quality, as well as to control micro-climate conditions to maximize the production of fruits and vegetables in greenhouses. Weather control and air quality applications can be carried out thanks to humidity and temperature sensors and pollution detectors (CO2, NO2, CO, O3). Waspmote is an open source wireless sensor platform specially focused on the implementation of low consumption modes which allows the sensor nodes ("motes") to be completely autonomous, which is battery powered. Lifetime of Waspmote sensor nodes may go from 1 to 5 years depending on the duty cycle and the radio used. Waspmote is based on a modular architecture. The idea is to integrate only the modules needed in each device optimizing costs. For this reason all the modules (radios, sensor boards, etc.) plug in Waspmote through sockets. 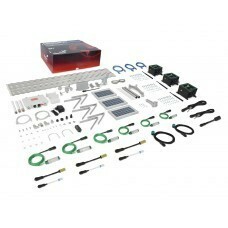 This Kit includes the complete equipment for technology evaluation. The purpose of the Waspmote Smart Cities Board is to extend the monitoring functionalities of the Smart Metering Board from indoor environments to outdoor locations. Apart from the humidity, luminosity and temperature sensors, present in all the Libelium boards, other three sensors for specific applications have been included: three sensors destined to monitoring cracks in buildings and structures, a linear displacement sensor (SLS095) for crack width, a single strand strain gage for crack detection and a multiple strand strain gage for crack propagation. Also a dust and PM-10 particles sensor (GP2Y1010AU0F) has been introduced, used to measure the concentration of particles in suspension in the environment in air quality control applications, and finally the WM-61A microphone, adapted to measure the environmental noise in the A decibels scale. 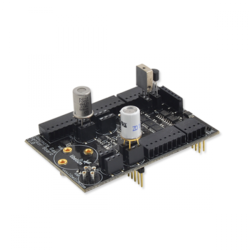 The Waspmote Smart Cities Board may take up to 9 sensors. This kit includes 4 of them. Waspmote is an open source wireless sensor platform specially focused on the implementation of low consumption modes which allows the sensor nodes ("motes") to be completely autonomous that is battery powered. Lifetime of Waspmote sensor nodes may go from 1 to 5 years depending on the duty cycle and the radio used. 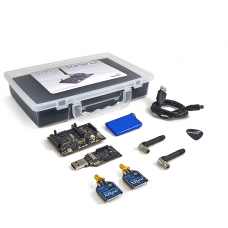 - ZigBee:/802.15.4 modules (2.4GHz, 868MHz, 900MHz).Low and high power. 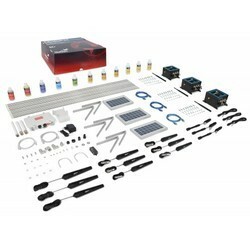 NOTE: The total purchase value of the kit items separately is 300+ €. When purchased as a kit, you save almost 35% on the retail price of these separate items. 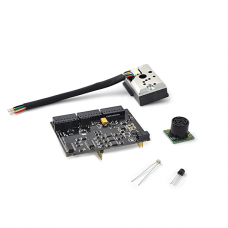 NOTE: This product is compatible with Arduino, Raspberry Pi and Intel Galileo boards. 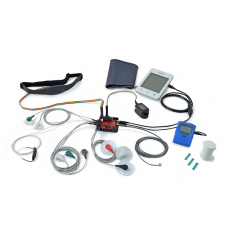 IMPORTANT: The e-Health Sensor Platform has been designed in order to help researchers, developers and artists to measure biometric sensor data for experimentation, fun and test purposes. However, as the platform does not have medical certifications it cannot be used to monitor critical patients who need accurate medical monitoring or those whose conditions must be accurately measured for an ulterior professional diagnosis. The Smart Environment IoT Vertical Kit allows to monitor temperature and humidity, as well as measuring levels of CO, CO2 and O3. 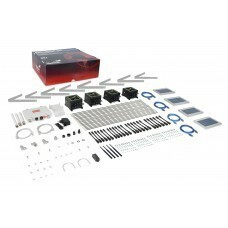 This kit can be used to control air pollution from cars and toxic gases generated in factories and farms (CO). These same gases can be monitored to ensure workers and goods safety inside chemical plants, and to reduce the presence of ozone in the drying meat process in food factories. Looking for Smart City ?